Personalization was a theme that dominated Las Vegas last week across three events.mpressed crowds at the Aria, while IBM showcased their InterConnect event at the MGM Grand. Meanwhile, Adobe dominated the proceedings with slick keynotes, glitz, and glamor with an appearance from Hollywood actor Ryan Gosling at the Adobe Digital Summit. Anyone closely following how digital experiences and the digital transformation is changing our world would have been excited by Adobe’s vision of our immediate future. Empowering every person and every organization to provide end-to-end digital shopping experiences using the personalization capabilities of Adobe Experience Manager is unquestionably impressive. Adobe’s analytics and targeting engine are also designed to adapt personalized experiences in real time based on customer behaviors, preferences, and past purchases. However, Evergage CEO Karl Wirth believes that there’s just not much steak behind the sizzle. Wirth believes there is a mismatch between hype and reality that has set the market’s expectations for what is possible with personalization. Although he is in agreement that personalized web experiences increase brand engagement and conversion, the CEO argues that personalization is only effective if applied in real-time. While IBM, Oracle, and Adobe all offer similar capabilities, Evergage, pride themselves on delivering true real-time personalization rather than “next time” personalization which is something they believe their competitors cannot currently compete with. In comparison with the Wizard of Oz, Wirth also wrote a blog post urging marketers to look behind the curtain. However, the argument on who could offer the best service took a dark comic twist last week as the team from Evergage attempted to troll Adobe at their own event. Gatecrashing the Summit to make the 12,000 attendees aware of an alternative product was an incredibly bold or aggressive move depending on your school of thought. In reality, it felt much more like a light-hearted and humorous look at the Adobe approach to personalization compared to the Evergage platform. The #AdobeAlternative hashtag may not have gone viral, but the startup succeeded in their mission of delivering a message that there is an alternative solution out there that is marketer-friendly, easy to implement and offers true real-time personalization. Crashing your competitor’s event is becoming somewhat of a trend, and this latest battle was slightly reminiscent of when Utah unicorn Domo hijacked the spotlight at the Tableau Conference by arriving with Flo Rida and Snoop Dogg last year. 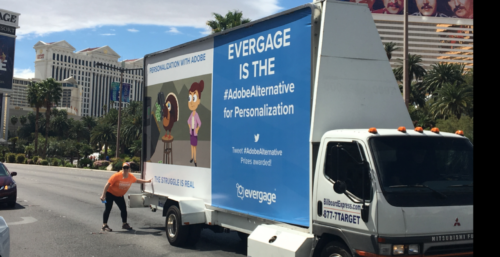 When it comes to a marketing technology fight, Evergage was always going to be the underdog against a behemoth like Adobe. But, broadcasting a message that there is more than one way to empower marketers to turn the dream of 1:1 customer engagement into reality can only be a good thing in the name of competition. Ultimately, competition creates innovation that in turn creates more efficient platforms to ensure that both consumers and business win. Evergage’s CEO Karl Wirth recently appeared on my podcast. He talked about how his cloud-based platform delivers real-time personalization to more than 2 billion web visitors, the reasons behind their recent campaign and what caused him to reflect on the Wizard of Oz.